Gardening doesn’t have to be complicated, but there are a few things that you have to have to make it work. You have to have plants or seeds, a place for them to grow, and also water and sunlight. You can use municipal water for your garden, but the downside of that is it doesn’t come free. However, if you are lucky enough to live in a location where it rains, you can offset at least part of that cost by using rainwater in your garden instead. In many areas, with some pre-planning you can even use rainwater for all your landscaping water needs! The simplest way to put rainwater to work in your garden is to have a depressed garden. Now, I don’t mean a garden to help treat depression (although gardening CAN be great for that)! I’m talking about planting your garden so that it is slightly below the ground surrounding it. Raised garden beds are all the rage right now. They can be very useful for creating great soil and for reducing weeds, but they don’t make much sense if you live in a very dry area. If you can put your garden in a naturally lower part of the yard, it can benefit from rain run off from the surround areas. If you don’t have a good spot like that, you can make your own! Waffle gardens have been used historically to grow plants in very arid parts of the world. They work great for square foot gardening too, depending on how big you make each square. To make a waffle garden, dig slightly into the ground and use the extra soil to create earth walls around the indented part. These walls will hold in water around the base of the plant after rainstorms and be available to the plant much longer than if it were planted in a raised bed or on a flat garden! A waffle garden is like the small scale version of swales and berms. Essentially the raised walls of the waffle garden are like a berm. The indented part in the middle is a trench. Together they make a swale. On a large scale you can use swales and berms to direct and harvest rainwater for your entire property. Storing water in your soil is the most effective way to utilize it. Just one inch of rain falling on a 1,000 square foot roof can produce 600 gallons of rainwater! Our most recent rainstorm yielded approximately 2,400 gallons of water and that’s all got to go somewhere. Ultimately, that means the ground, and the better prepared you are to use all that water, the better! Creating swales is one of those trick permaculture concepts that always make more sense once you see it in action. I have not yet made swales on our property, but when we are ready for earthworks, I will be turning to The Suburban Micro-Farm by Amy Stross. Her book has some great advice based on her experience of creating a front yard garden using a trench and berm to capture rainwater from their roof. Plus, the new edition contains color pictures. So, you can see the how to pictures as well as the after pictures. Amy was gracious enough to send me a copy of the new edition and as much as I liked the original, having the pictures in color makes it even more enjoyable to read. You can also add a rain garden if it is legal where you live. You’ll want to make sure it’s situated at least 10 feet away from any buildings, and that it is deep enough to handle the run off from your roof. You’ll also want to make sure you’re creating a rain garden, and not a pond, so some drainage is necessary. Select native or edible plants to be planted inside the rain garden. Plants with deep roots are good choices so that they can withstand dry periods between rain storms. Put the plants that can handle the wettest conditions at the lowest spots and those that can handle drier conditions closer to the top edges. (The Suburban Micro-Farm has some good suggestions for plants to use). It’s also a good idea to keep your rain garden well mulched. Rain barrels can’t store as much water as your garden itself can, but it they can be very useful. In an emergency, you can filter rain water to drink. You may even be able to save enough rainwater in your rain barrels that you can use it to water your plants when needed. It’s not impossible to store enough water to fill all your household needs, but most of us probably don’t want to devote that much space. It’s very practical to add a rain barrel or two at each of your downspouts. You can then direct any overflow from the rain barrels into a swale and funneled away from the house and towards a rain garden. Using these methods together means that rain water stays on your site instead of running off down the street to a storm drain. It means your plants can utilize it and store it for later. It encourages them to root deeply, and it replenishes the ground water. Using rainwater in your garden can be as simple or as involved as you would like. 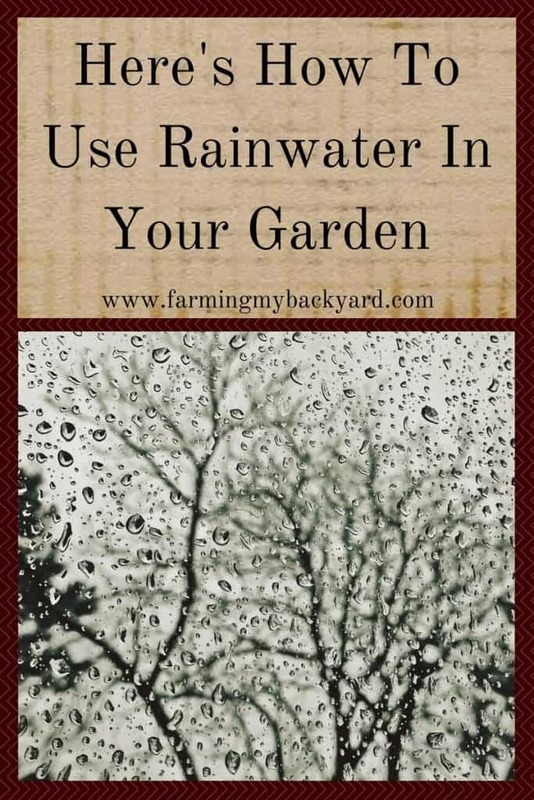 If using rainwater is new to you, try a basic waffle garden or a small rain barrel! If you’d like to use more of the rain in your area, I recommend getting started with swales or rain gardens. Others, such as Amy Stross, have used them with great success and they may be a great option for you as well. Want To Raise Happy Chickens? Subscribe for our newsletter and get the free email course Intro To Backyard Chickens as well as a free printable checklist to walk you through step by step! Can you be a homesteader even if you just have a regular yard in the city? Yes! 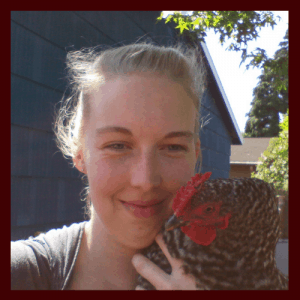 I’m Kathryn, and I’ve raised gardens, chickens, and rabbits on just 1/10th of an acre, and am starting from scratch building a new 1/2 acre homestead! You can grow food even in the city! Join the free email course and learn how to start gardening (even if you have a black thumb!) and finally save money and grow delicious vegetables! Click here for information on reviews, sponsored posts, and contact information.